Rachel Morse is a young bi-racial girl growing up in the early 1980s. Shoutout to my fellow 80s babies. She is the brown-skinned, blue-eyed daughter of a Danish woman and a black G.I. A family tragedy leaves Rachel the only survivor in her family. She goes to live with the grandmother she has never met in a black neighborhood in Portland, Oregon. For the first time Rachel feels like she has to choose between being white or black while adapting to a new environment and grieving her family. As if living with a recently met relative isn't enough, Rachel has to deal with being the new girl at school with "good hair" that "thinks she's cute." Racial identity is the main theme. 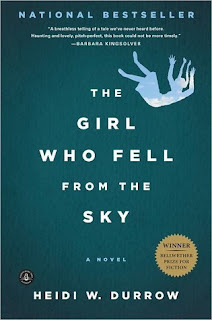 Over 70 of my bookhearts read and gave high ratings for The Girl Who Fell From the Sky. Yet it was an eBook that I downloaded immediately and just never read. I kept pushing it further down my TBR. Thanks to a reading challenge hosted by Bookish, May was the perfect month to read this classic. The problem with reading a popular award-winning novel is the high expectation it gives. I just knew this novel would be a page-turner and among my best books read ever. It had all the makings of a great classic: tragedy, unpredictable and gripping. Yet here I am standing in the corner alone not drinking the kool-aid that everyone swears is the bomb. It was far too easy to close the eBook and start another. I found the characters meh and the alternating narration a distraction. 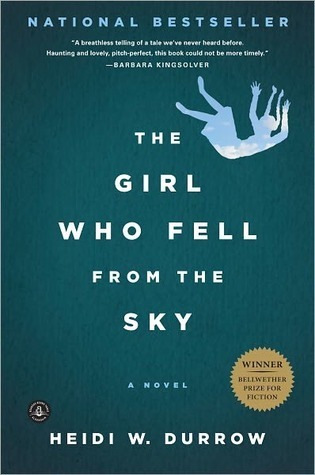 I give credit to author Heidi W. Durrow for her premise that draws from her own upbringing but The Girl Who Fell From the Sky was just okay to me. Perhaps I would have liked it more if it were a memoir instead of adapted to a coming-of-age fiction novel.